A pleasantly warm northern Indian summer welcomed devotees arriving for the second annual Sangam at YSS Noida Ashram. Drawing nearly 450 devotees from across different parts of India, this conducted spiritual programme gave a wonderful opportunity to sadhaks to deepen their practice of meditation and stay in silence in the beautiful environs of the ashram. During these five days, the attendees were provided with a schedule in which YSS sannyasis conducted reviews of meditation techniques and Energization Exercises, satsangas, group meditations, spiritual counselling, and Kriya Yoga diksha (initiation). The evening sessions included kirtans led by monastics or video shows on different days. 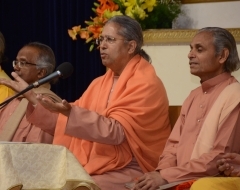 The sangam activities commenced on March 27, with the opening programme that included prayer, group meditation, kirtans, and the opening satsanga. 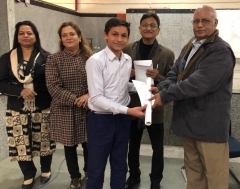 Five days later, on March 31, 2019, the Sangam concluded with several new initiates receiving Kriya Yoga diksha in a ceremony attended by 600 devotees, and a closing programme in the afternoon. Ahead of the programme on the first day of the sangam, all the participants joined in the singing of kirtans led by a group of devotees in the pandal. Swami Sadananda opened the morning programme with a prayer. The attendees then received a warm welcome to the ashram by Swami Vasudevananda, in which he encouraged them to make the most of the opportunity presented to them to deepen their meditations through perseverance, practicing detachment, along with surrender on the spiritual path – in order to benefit from their sangam stay at the ashram. In the opening satsanga that followed, Swami Smaranananda highlighted the value of exercise in one’s life. Through examples, he shared ways in which one can include physical exercise to energize oneself and rid the mind and body of disease and worry. He reminded the attendees of the importance of practicing the Energization Exercises as part of the daily meditation routine of a YSS devotee. The human body is designed for movement and something that is not used becomes rusty, he said, adding that Energization Exercises address movement in even those body parts that may be in marginal use. In the afternoon, Swami Sadananda conducted the first of a two-part review of Energization Exercises, which was concluded on the following day. The Hong-Sau technique of meditation was reviewed by Brahmachari Sheelananda in the morning session. The review was followed by a discourse on the healing power of forgiveness by Swami Vasudevananda. Describing it as a divine quality which is the bedrock of continuation of life on earth as it holds the universe together, he inspired devotees to go ahead and practice forgiveness. One can never forgive if influenced by anger as this destroys spirituality; the spirit of forgiveness, he said, comes from long practice of spiritual discipline and humility. Designated time for counselling with monastics were availed of by several devotees seeking answers to their spiritual queries. They also got an opportunity to practice group meditation thrice a day – in the morning, at noon and in the evening. Locating spots of shade in the ashram gardens, some devotees meditated outside as well, surrounded by flowers of bright hues. The programme on the third day began with a satsanga by Swami Vasudevananda about living in the present moment, wherein he encouraged the devotees to forget the past as it is over and we must not let it limit us, and not worry about the future as it is only imagined – something on which we can have no control. Be in the present fully because we are living in it now. While learning from the past, it is the present that will create our future. Our past mistakes are overcome by deep meditation and with affirmations done with strong will power. 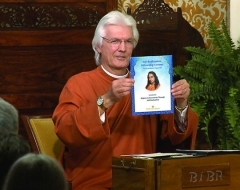 The Aum technique was reviewed by Brahmachari Alokananda. During the afternoon session, Brahmachari Sheelananda gave a discourse on affirmation as a tool for spiritual transformation. Amongst the YSS lessons and literature, metaphysical affirmations form an effective tool of life, he said, advising that one must be completely convinced by the power of the words being affirmed, and repeatedly affirm it with a positive feeling with dedication and devotion to the Guru. Once life changes spiritually, the rest gets transformed and mental affirmation becomes meditative affirmation. The evening provided an opportunity to the spiritual gathering to immerse themselves in devotional chanting of kirtans serenading God and Gurus, led by Swami Vasudevananda. The session also included a few of Gurudeva Sri Sri Paramahansa Yogananandaji’s Cosmic Chants. Later in the day, Swami Smaranananda explained the principles of effective prayer through a discourse wherein he guided devotees to offer prayers with the correct approach. Prayers are relinquishment, surrender, he said, advising the attendees to never put a condition while praying to God and curtail His freedom which creates a wall that impedes the flow of blessings. In the 'Question and Answer' session conducted by Swami Vasudevananda, he addressed the various queries submitted by devotees during the course of the programme. In the evening, Brahmachari Alokananda conducted a three-hour-long meditation. The final day of the sangam began with the sacred kriya Yoga diksha ceremony conducted by Swami Smaranananda. About 60 devotees received Kriya Yoga initiation in the presence of around 500 Kriyaban devotees in this programme. A satsanga for non-Kriyabans was conducted by Brahmachari Alokananda in the Dhyana Mandir alongside the Kriya Diksha programme in the pandal. Kriya prasad was served to all the attendees. In the afternoon session, a review of Kriya Yoga technique was conducted by Swami Sadananda. During the closing programme in the late afternoon, Swami Smaranananda gave a discourse on the significance of regularity in meditation and the role of devotion, faith, surrender and patience in success on the spiritual path. Thanking the devotees for their joyous participation in all the programmes, Swami Vasudevananda offered his gratitude to the dedicated volunteers who helped in organising the sangam. Venturing out of the pandal after the evening meditation, devotees were enthralled by the brightly-lit facade of the ashram buildings, and the twinkling of tiny lights – electric as well as candle lamps – in the shades of red, blue, yellow and green adorning the ashram gardens. Devotees who took part in this sacred gathering shared that the review classes, especially the Kriya ceremony, reminded them of key points in the practice of YSS meditation techniques. To view glimpses from these five days of Noida Sangam II, click here.